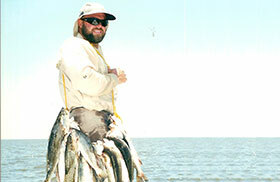 Speckled trout are showing up in the shallow lakes and pipe line canals by the hundreds. 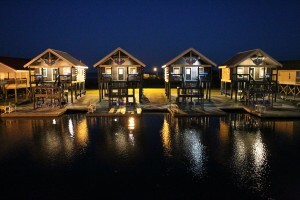 Bayou Log Cabins Fishing lodge is located thirty-five miles south of New Orleans Louisiana and the fishing is fantastic this time of the year. 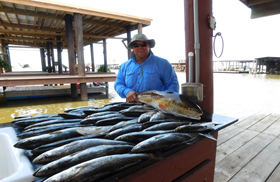 This is the time of the year that the egg sacks go flat with no eggs and all the trout migrate in from the barrier islands all along the Louisiana coast. I always like to think that this is the best time of the year for family fishing. 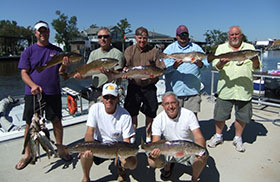 You don’t have to travel far to get into a wonderful speckled trout bite, so with that said you do not need a big boat. You will not have to go through any open water this time of the year as we have lots of trout showing up less than one mile from the fishing lodge. 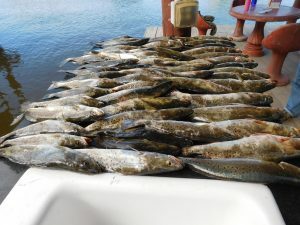 It is an early morning bite, so you will have to get up and get the boat ready so that when it is safe to travel you are ready to depart to your favorite fishing spot. We are still using live shrimp for bait. Some folks are swapping over to soft plastics however I am still catching live shrimp indicating the live shrimp are still in the area. Remember this, live shrimp will always out fish any artificial bait on the planet. Some people will disagree with me and that is ok, but I can assure you that if they ever want to give it a try and fish with me, I can show them what I am talking about. Now I am not saying you will not catch on plastics during the fall fishing season, but what I am saying is that the speckled trout and red fish prefer live shrimp because that is what they are used to eating. Sometime soon I will change over to soft plastics because all the shrimp will be headed out to the Gulf of Mexico. 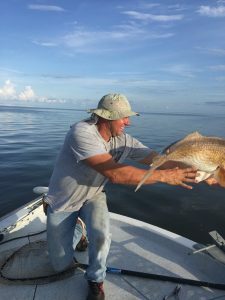 That is when the fishing gets real interesting around here because there is no live bait left in the interior bays and pipe line canals, so they will bite on just about anything. Some folks have their favorite; however, I can tell you that during this time of the year you can just about use anything, and they will attack it like they are mad at it. 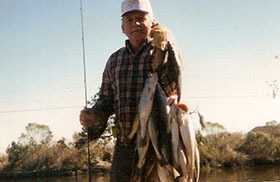 I have taken a small piece of a white rag and put it on a hook and caught speckled trout during the winter fishing season. It is a Mistry why the trout stay in close during this time of the year with nothing to feed on. Normally the fish will follow the food chain and go wherever the feed is. It is a repeated process every year that the trout will stay in close during the fall season until we start getting some cold nights. 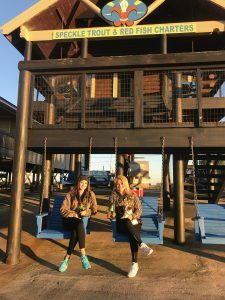 Once the temperature gets close to freezing and the water temperature drops below a certain point they will get together and head out to the Gulf of Mexico for the duration of the winter months. After that we can start looking for them to show back up on the oyster reefs near the barrier islands sometime in the beginning of April. Based on what I just talked about the only two months you can’t fish for speckled trout around this area is January and February. I always tell people that is the eight weeks you have to do your repairs and upgrades to you boat and fishing equipment. 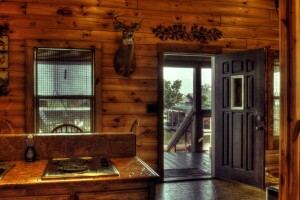 Take your wife on a vacation and do all the things that might keep you from fishing during the other ten months. I had the opportunity to fish with a family from out of town this weekend and it was such a pleasure to spend the day on the water with them. It was the guy who book the trip, his wife and two small children. Both days we fished the wind was blowing out of the northeast at about fifteen to twenty mph. It was some of the toughest conditions you could possible fish in and still we were able to box up some nice speckled tout and red fish. Of course, we did not slam the fish, but the bite was steady, and they were able to catch some nice fish. At the end of the second day of fishing the father came up to me an thanked me for the two days of fishing that we had just finished. I began to explain to him how I was sorry that the conditions were not favorable and that is the reason we did not do as good as I had hoped. He stopped me while I was telling him and began to tell me that he and his family had the best time that they had ever had while on a fishing trip. I didn’t understand at first because we didn’t catch our limit neither day. He told me that the ride out in the morning watching the sun rise out of the broken marsh and seeing all the wildlife come to life was worth the trip. Then he went on to tell me that his boys had never caught a red fish before and watching his wife taking photos of the boys holding the fish they had just caught was more than slamming a box of fish. It was then that I began to understand what he was talking about. You see, we are so spoiled down here south of New Orleans Louisiana always trying to put people on a full box of fish that we too get lost in the business side of things and forget to see the beauty of simply enjoying the day on the water. 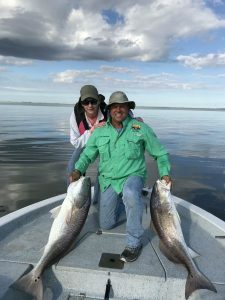 Catching a nice mix of speckled trout and red fish and getting to see the wonders of all the wildlife as well as the moraine life we have is truly what it is all about. Remember building memories with your family and friends is what it is all about.